Cindy I-Fen Cheng. Citizens of Asian America: Democracy and Race during the Cold War. NYU Press, 2014. During the Cold War, Soviet propaganda highlighted U.S. racism in order to undermine the credibility of U.S. democracy. In response, incorporating racial and ethnic minorities in order to affirm that America worked to ensure the rights of all and was superior to communist countries became a national imperative. 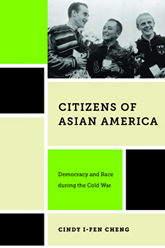 In Citizens of Asian America , Cindy I-Fen Cheng explores how Asian Americans figured in this effort to shape the credibility of American democracy, even while the perceived “foreignness” of Asian Americans cast them as likely alien subversives whose activities needed monitoring following the communist revolution in China and the outbreak of the Korean War. While histories of international politics and U.S. race relations during the Cold War have largely overlooked the significance of Asian Americans, Cheng challenges the black-white focus of the existing historiography. She highlights how Asian Americans made use of the government’s desire to be leader of the “free world” by advocating for civil rights reforms, such as housing integration, increased professional opportunities, and freedom from political persecution. Further, Cheng examines the liberalization of immigration policies, which worked not only to increase the civil rights of Asian Americans but also to improve the nation’s ties with Asian countries, providing an opportunity for the U.S. government to broadcast, on a global scale, the freedom and opportunity that American society could offer.